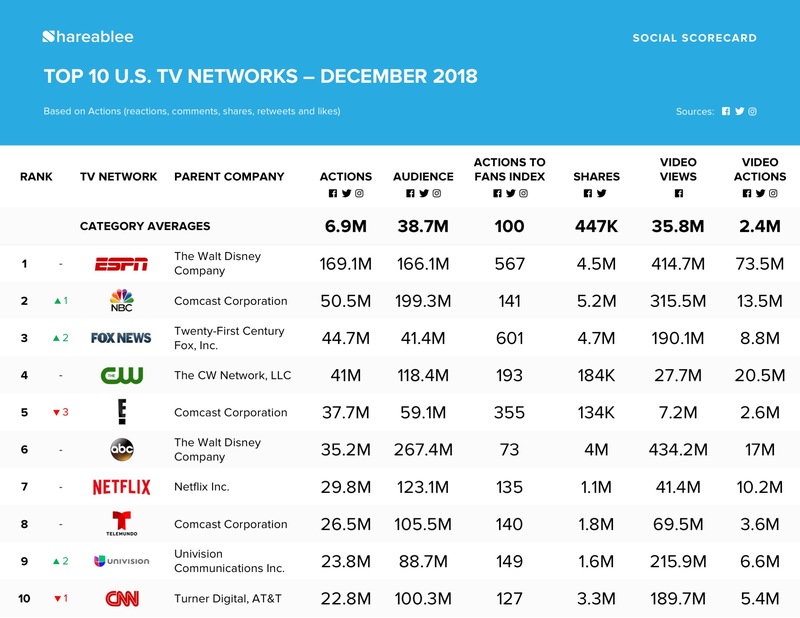 NEW YORK, January 9, 2019	(Newswire.com) - Shareablee Inc., the global leader in audience-based social media measurement, today released their ranking of the most socially engaged American TV networks for December 2018. 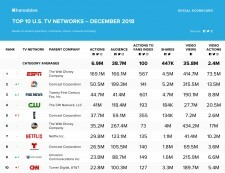 The ranking includes all television shows and all main network brand accounts under their respective networks, which were down 16.3 percent in overall engagement and reflected a total of 681 million actions (post-level reactions, shares, comments, retweets, and likes) across Facebook, Twitter, and Instagram in over the last month. Disney’s ESPN earned the top ranking last month with 169.1 million cross-platform actions, while NBC ranked second with 50.5 million actions. FOX News came in third with 44.7 million actions, followed by The CW (41 million actions), and E! (37.7 million actions). The top-ranked Primetime TV shows on social media last month were NBC’s E! News (28.4 million actions), The CW’s Riverdale (22.9 million actions), CBS’ Entertainment Tonight (7.7 million actions), The CW’s The Flash (5.9 million), and The Voice (3.4 million actions). The Voice partnership with Target featuring Jennifer Hudson was the top branded content in December with 4.1K shares, 28.8K reactions, and 1.3K comments. ABC Television topped the video rankings with 434.2 million views in December, followed by ESPN with 414.7 million views, and NBC with 315.5 million views. The fastest growing in TV networks, in terms of number of engagements, in December was Cinemax (up 222.9 percent), Discovery Life Channel (up 160 percent), TV Land (up 152.3 percent), LMN (up 119.1 percent), and Ovation (up 46.2 percent).